Today, a new threat has emerged, not internally but externally across the South China Sea. China, a nuclear armed state and the superpower in our region, wants to seize 80 percent of our Exclusive Economic Zone in the West Philippine Sea. The Chinese Foreign Minister Wang Yi declared before an international audience in Washington, DC in February 2016 that the Philippines and China are “very close neighbors” separated only by a “narrow body of water.” That “narrow body of water” is the distance between our shorelines in Palawan and Luzon and China’s nine-dashed line. That means we would have a common sea boundary with China stretching 1,700 kilometers long, starting 64 kilometers off the coast of Balabac Island, our southernmost island in Palawan, to 44 kilometers off the coast of Y’ami Island, our northernmost island in the Batanes. 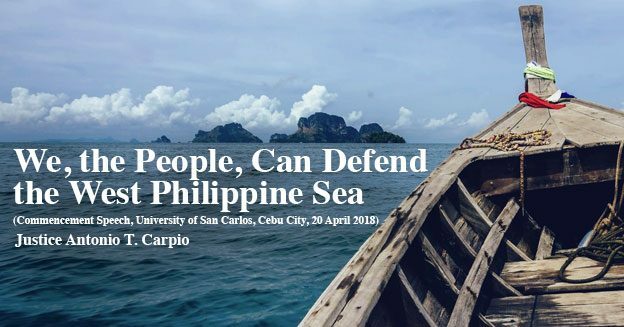 This huge maritime area that China wants to grab from the Philippines, an area larger than the total land area of the Philippines, is rich in fishery, oil, gas and other mineral resources. If will lose this huge maritime area, we lose it forever. This generation, and future generations of Filipinos, will never be able to recover this vast area with all its rich natural resources. I call this the gravest external threat to the Philippines since World War II, bar none.